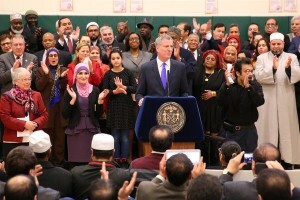 New York will become the nation’s first major metropolis to close its public schools in observance of the two most sacred Muslim holy days, Mayor Bill de Blasio said on Wednesday. Several municipalities across the country — including in Massachusetts, Michigan and New Jersey — have moved in recent years to include the holy days, Eid al-Fitr and Eid al-Adha, in their school calendars. But New York City, with its 1.1 million schoolchildren, dwarfs the others in its size and symbolism. 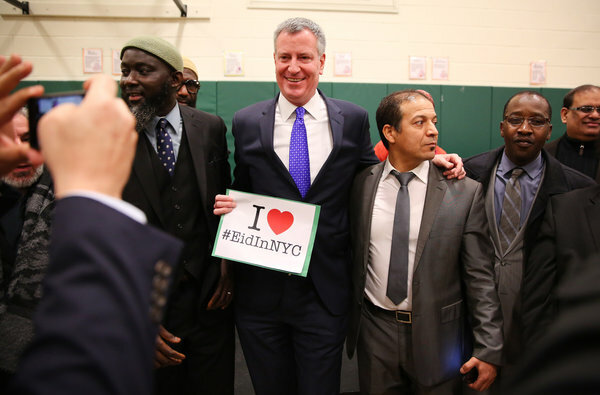 For Muslim activists, who have spent years trying to raise their political profile, the mayor’s announcement was taken as a significant victory, and an indication that they had matured as a constituency with tangible influence on public policy. “When these holidays are recognized, it’s a sign that Muslims have a role in the political and social fabric of America,” said Ibrahim Hooper, a spokesman for the Council on American-Islamic Relations, the nation’s largest Muslim civil rights and advocacy group. At least six school districts nationally, including Cambridge, Mass. ; Dearborn, Mich.; Burlington, Vt.; and Paterson and South Brunswick, N.J., have granted days off for the major Muslim holidays. Many more districts recognize the holidays in other ways, such as noting them on the school calendar or granting excused absences for observant students. In New York, a group of Muslims has spent nine years pressing for inclusion on the city’s school calendar, which already recognizes several Jewish and Christian holidays. Muslims make up about 10 percent of the student body in the city’s public schools, according to a 2008 study by Columbia University. Mr. de Blasio had no objections: He pledged as a candidate in 2013 to close schools on the two Muslim holy days. On Wednesday, the mayor said that the changes would take effect in the coming academic year. Eid al-Adha, also known as the Festival of Sacrifice, commemorates the willingness of Ibrahim, or Abraham, to sacrifice his son to God. Eid al-Fitr marks the end of the holy month of fasting for Ramadan, which is signaled by the sighting of the crescent moon. The exact timing of the holy days changes year to year because they are based on a lunar calendar. In the coming school year, classes will start a day earlier in September to account for Eid al-Adha, which falls on Sept. 24, a Thursday; in 2016, Eid al-Fitr falls during the summer. In interviews on Wednesday, Muslim students and parents reacted with delight. Ilham Atmani, who was born in Morocco and lives in Bay Ridge, Brooklyn, said she had been frustrated having to take her four children out of classes. “I know that Muslims are a minority, but we have to be recognized,” she said. Helal Chowdhury, 15, a sophomore at Brooklyn Technical High School, said that every year he had to choose between celebrating the holidays with his family and going to school so he would not fall behind. Helal, who wants to be a doctor, said he had had a perfect attendance record for the past several years and that school always seemed to win. Speaking at a school gymnasium in Bay Ridge on Wednesday, Mr. de Blasio, flanked by jubilant Muslim activists and city officials, was asked if he was concerned about a right-wing backlash to his decision.